You don't have to be a runner to complete a marathon. Many walkers set a goal of walking the 26.2-mile competition, which can generally be achieved in six to eight hours (or more) at a walking pace. While walking a marathon may not be as laborious as running one, dedicating yourself to proper training is essential to achieving this goal. People have many reasons for walking instead of running a marathon. For example, former runners who experience joint pain often switch to walking because it puts less stress on joints. Others just prefer walking to running and seek out marathons for the challenge. Whatever your reason, make sure you're ready before race day. Are You Ready to Train to Walk a Marathon? The marathon is a seriously tough distance. Most healthy people can do it if they dedicate themselves to a strategic training schedule and give themselves at least nine months to prepare. Before you register for your first marathon, check to make sure this is a realistic goal for you at this time. Prior to starting your training, you should already be able to comfortably walk at a fast pace for at least one hour. You may also consider consulting with your doctor. Also, make sure you have the time to devote to training. You can expect to have to complete three one-hour walks and a longer walk (lasting two to six hours) every week. During training, you will build your stamina by distance walking four days a week, starting with 20 miles in a week and increasing each week to up to 38 miles a few weeks before the race. This is broken down with three 4-mile walks and one distance-building walk each week. Consult with your doctor to make sure you are healthy enough to train for a marathon. Some marathons, like those in France and Italy, require a medical certificate from your doctor to participate. Once you've set your goal and carved out time in your schedule to train, there are a few things you will need to do. Buy proper running shoes: Your footwear is an essential part of making it through training and to the finish line. You may need more cushioning to lessen fatigue and the impact of long-distance training, so you need to ensure you have the right kind of shoes. Your first stop should be to a dedicated running-shoe store to be fitted for shoes to use in training and on race day. Get the right gear: What you wear for long-distance walking isn't the same as what you'd wear for a leisurely stroll. You'll need clothes that help to prevent chaffing and to wear layers that are appropriate for the season. With many months of training ahead of you, you will likely need gear for winter, summer, and rainy weather. You may also want to invest in a running belt to hold your keys, a fitness tracker or smartwatch, an arm-strap phone holder, earbuds that twist into place, and other running gear. Learn about nutrition and hydration: When you are walking for hours at a time, you need to use energy snacks, water, and electrolyte-replacement drinks to keep going. Learn what to eat to fuel your marathon training and how to hydrate on your long walks. 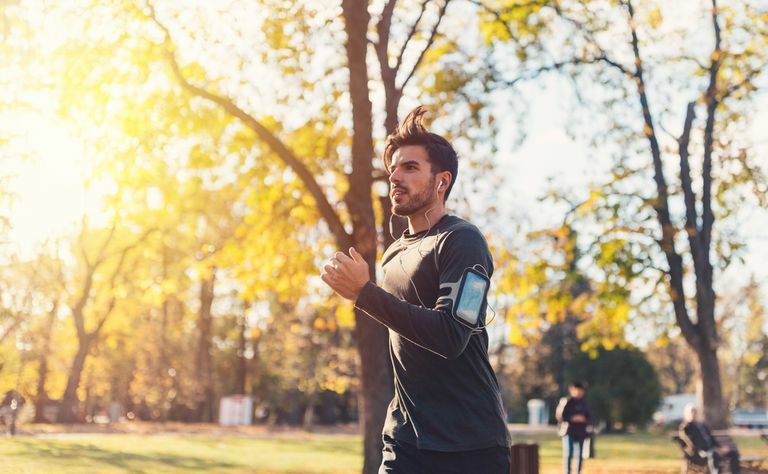 Build your base mileage: Before starting an official marathon mileage-building schedule, you should be able to walk comfortably at a brisk pace for one hour. From that point, you then build your mileage at 10 percent per week and do a brisk walking workout at least four days per week. You'll have one longer walk each week until you are able to walk comfortably for 8 miles. Prevent injuries: Blisters and chafing are the biggest banes of long-distance walkers. Whether they occur on your feet, armpits, crotch, or chest, there are different strategies for preventing these painful skin issues throughout training and on race day including wearing proper-fitting shoes and wicking clothing and using lubricants. Other injuries include cramps, strains, sprains, and stomach issues. Learn how to prevent and treat common marathon injuries before you start training. Once you have the right gear and have built up your base mileage, you are ready to start officially training for the marathon. Here's a timeline of what you'll need to do to be ready for race day. Now is the time to starting building mileage to prepare for the 26.2-mile race. Find and commit to a training schedule that will help you increase your long distance mileage, as well as build your speed and aerobic capacity. The final month of training includes your longest walk You will make any adjustments in what you'll be wearing and fine-tune how to eat and drink throughout a long walk. You'll know what works best for you to prevent blisters. After your longest training walk, you will begin tapering before your marathon by scaling back on mileage during your walks for two weeks before the race. This will give your body time to restore itself after your longest training day and be at its peak on race day. For example, after reaching a peak total of 38 miles in week 16, you will taper down to 30 miles the next week, and 22 miles in the final week of training. Research shows this period of tapering replenishes the body's stores of muscle glycogen, enzymes, antioxidants, and hormones, and improves race-day performance by about 3 percent. It's almost go time! You'll need to eat right, stay hydrated, get proper sleep, and ensure you have all of your gear ready for the day of the race. If you are traveling to a marathon in a different city, you'll need to pay extra attention to making sure you have what you need to be prepared for the race and for any weather. You will also pick up your bib and timing chip in the days leading up to the race. You have likely heard that you should load up on carbohydrates immediately before the marathon. The newest thinking is that you shouldn't overdo it. You don't want to eat anything new or different right before the race. If you haven't already, now is the time to study the route map and know where the aid stations, water stations, and restrooms are along the course. You've trained for months and the race day is finally here. Keep in mind, the race is going to be different from a training walk. Here are some essentials for strategy and recovery. Before the race: Be sure to wake up a few hours before the race so you have time to prepare. Two hours before the marathon, drink 16 ounces of water to ensure your body is hydrated. Check the weather: You might have avoided rain on your long training walks, but you aren't going have a choice on race day. Learn what to do when racing in the rain. You'll need tactics to keep comfortable for the hours on the course. Congratulations! You completed your first marathon. First, be sure to celebrate. Wear your medal and race shirt with pride. You have joined the community of marathoners. Runners will give you proper respect as few of them have ever gone the distance. Here's what to expect after the race is over. Soreness: Between blisters, black toenails, and overall muscle aches from walking 26.2 miles, the aftermath of the race may not be pretty. Exhaustion and mixed emotions: After achieving the goal you've focused on for months, many racers experience post-race blues coupled with extreme tiredness. After a few days, this usually passes and many marathoners then start planning their next race.